I once casually flirted with the idea of hating Sidney Crosby. I didn’t really have any reason, but I found him extremely hateable when he played against the Leafs (the first sign I should hate a player). This was mainly because he burned them with such regularity, but that’s usually why I start hating a player. That and bad haircuts (Hartnell for instance). I felt this way about Crosby until the 2008 playoffs. The sheer determination and will of Crosby was unbelievable. It was at this moment that I first noticed how extremely hard he works. Just watch him play. He wants the puck more than anybody else. He wants the game on his stick; he wants to win. Hockey matters to him. Intensely. Maybe because I am so maniacally into hockey I’d like that my favourite hockey players be too. The game should matter a little too much to them. They should feel upset after each loss. My growing Crosboner amplified in the 2009 playoffs when it seemed that nothing would stop him from hoisting his first Stanley Cup. The man could not be stopped. It showed in his demeanour. He elevated his game against Ovechkin and the Capitals and proved why the Penguins are superior to the Capitals. 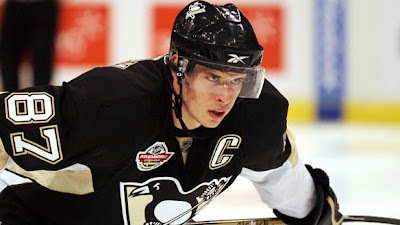 Then the Stanley Cup Final was a real life revenge thriller starring Crosby and Malkin. One stat that reveals Crosby’s work ethic is his face-off percentage. During Crosby’s rookie year he was pretty poor at taking draws. That year Crosby was 85th in the league with a disastrous 45.5% efficiency. This was a weakness to his game that he addressed and worked very hard at improving. This year Crosby ranks 8th in the league at 58%, which is close to a 7% improvement from last season. What’s more impressive is that he’s maintained this rate while taking more face-offs than anyone except for Paul Stasny (whose rate is below 50%). According to CBC’s Elliotte Friedman, Crosby has improved by understanding the strategy of other centres he’s facing, using his wingers more effectively, and practicing against bigger players like Jordan Staal and Mike Rupp. Crosby is also proving this year that he is more than just a playmaker. Everyone knows that the Kid has an unhealthy on-ice vision, but he’s finding the back of the net with increased regularity this season. With a struggling Evgeni Malkin (by his lofty standards), there is an increased onus on Crosby to provide a greater share of the offense for the champion Penguins. Especially when the rest of the forwards not named Malkin are the likes of Bill Guerin, Ruslan Fedotenko, Chris Kunitz, and Jordan Staal (who is good, but more of a solid two-way type player). While Crosby has never been really considered a goal-scorer he has only scored fewer than 30 goals only once and that was during an injury filled campaign where he only played in only 53 games, yet still scored 24 goals. However, this year he’s looking more Ovechkin than Thornton. He’s on pace to score over 50 goals and is a legitimate threat to win the Rocket Richard Trophy. The Penguins acquisition of Gary Roberts at the 2007 trade deadline was another pivotal moment in Crosby’s development as a complete player. The veteran presence of Roberts showed Crosby and the rest of the Penguins the type of sacrifice and determination that it takes for a team to win in the playoffs. Although his arrival didn’t necessarily bring immediate results (since the Pens lost in the first round), it certainly had a long-lasting impact on the players and Crosby. The results were evident in the last two playoffs. Maybe Mike Knuble will provide the Capitals with a similar improvement. But enough of the accolades, this isn’t a Crosby fan-site. The people who hate Sidney Crosby do so in spite of his talents as a hockey player. The cry-baby labels were certainly justifiable during his first few years in the league. Crosby barked at the refs for seemingly every slight against him. Maybe he believed his own hype and thought of himself above the game. I doubt that, but he certainly acted like it. It got to the point that Don Cherry reprimanded the Kid on Coach’s Corner. I think this played a large role in Crosby’s development as a complete hockey player. He realized what he was doing was embarrassing and for the most part he’s stopped. Sure, occasionally he gives the refs an incredulous look, but it’s no different from the reaction that every player gives when they’ve been sentenced to the penalty box. People deride Crosby because they have already made up their minds about him. He’s a whiner and so he shall always be. To think someone would actually have to admit they were wrong and change their opinion on something. I’m guilty of this as well. It’s hard to change your opinion on things when you’ve defended them vehemently in the past. My prime example is hating on Marc Savard as a fake player. During his tenure in Atlanta I wrongfully assumed his points were a result of playing between Hossa and Kovalchuk. How wrong of me. I’ve admitted my mistake and focus my energies on labelling Rich Peverley a fake player. The Vancouver Olympics will be the setting for Crosby’s great transformation in the eyes of many hockey fans. Many people already know they will love Crosby during the Olympics as he plays for Canada. They will then proceed to return to their loathing ways afterwards, but I don’t know if it will be so easy after they see him play in a different light. So, you can keep your negative opinion of Sidney Crosby. Maybe in your mind he’s still the whiny, little 18-year old your contrarian self refused to appreciate, but you’re missing out on marvelling in one of the best hockey players of this generation. Plus, he’s Canada’s ace-in-the-hole against the Big Red Machine. you made the big leagues! pretty awesome that they let you keep all your old posts.